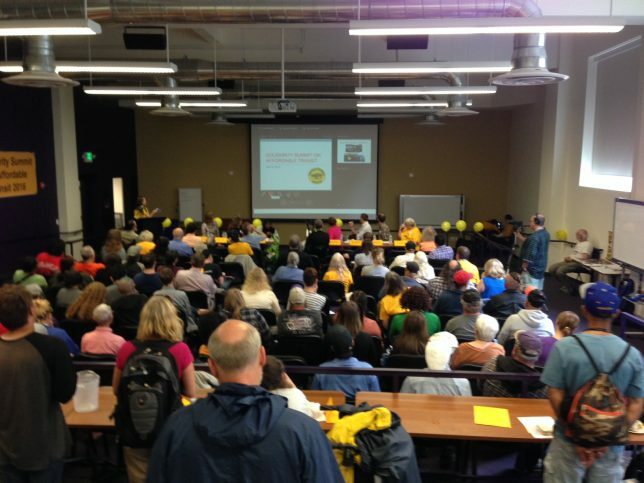 Thanks to everyone who attended the Solidarity Summit on Affordable Transit on July 26th! The house was packed with people and energy, and the afternoon was filled with great speakers, discussion & comradery. Special thanks to our panelists, emcee, workshop facilitators, and all the TRU members who volunteered their time and helped to make the event a success! If you didn’t make it, you can still watch the speaker program below. Big thanks to Mike McCormick, host of Mind Over Matters on KEXP, for taking the time to come out and record! As if to highlight the main theme of the Summit, during our speaker program the news broke that Calgary, Canada will start offering monthly transit passes to residents living in extreme poverty for just over $5. Stay tuned for actions and updates as TRU continues our campaign to improve transit access for homeless and very low-income riders! Come on, Seattle! We’ve got to beat Calgary. They charge $5.15 for a monthly pass. Let’s have a Seattle monthly pass at $5! Bragging rights for the city who really tries to help folks who are struggling with our new turbo-charged and very unfair high-rent low-wage economy. Transit Riders Union will be in hot pursuit until we get it! When you try to list all the types of people who should have lower or free fares, you will invariably leave someone out and you are definitely including people who don’t actually need it. Who DOES need it–people who can’t afford the current fares. Who are those people–how do we define them? Easy–ANYBODY who has an income at or below 50% (or 60% or 80%) of AMI (Area Median Income). Can we please STOP using euphemisms–“students”, “homeless”, “working families”, “seniors”, “disabled”, etc.? Some “social justice” programs use “racial equity” and “social” or “economic justice” interchangeably. That is another example of using (sometimes misleading and uninclusive) euphemisms, instead of just using the REAL words: poor, low income, “economically disadvantaged”. “Senior” and “youth” are NOT interchangeable with “poor”: Bill Gates is now a “senior”–does he or his kids and other seniors and young people living in multi-million-dollar homes need low bus fares? There are well-off (or at least “comfortable”) people in every category, including “students”, “seniors”, “disabled”, “families”, etc. Those categories DO NOT describe NEEDY low-income transit riders! In order to subsidize the fares of those who truly NEED lower bus fares, we need to be willing to allow Metro/ST/CT/ORCA to charge FULL FARE to those who can afford to pay (middle & upper-income riders, big employers), and reserve subsidized fares for just those who NEED them: ANYONE with a low income…of ANY AGE (youth/senior, in-between), of ANY STATUS (abled/disabled, student/working/not, housed/homeless)! Categories divide us and pit us against each other (“why should THEY get free fare when I have the same income?” “why does that college student living in a parent-paid condo get to pay less than my friend who works in a sandwhich shop & lives in a crappy studio?”). 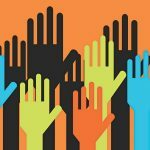 Let’s UNITE under one banner: “Transit for all–AFFORDABLE to ALL”, and let’s advocate for the ONE group that is INCLUSIVE of all who struggle to afford transit–Low Income People (aka “po’ folks”).